Culture In Florida is a monthly news roundup to show our state’s wonderful diversity, spotlight the organizations and artists that contribute so much to our communities, and stress the comprehensive benefits of arts and culture to Florida’s economy and quality of life. As promised last month, March was full of events across Florida. The Division of Cultural Affairs was busy, as were the many art, history, and science museums across the state. 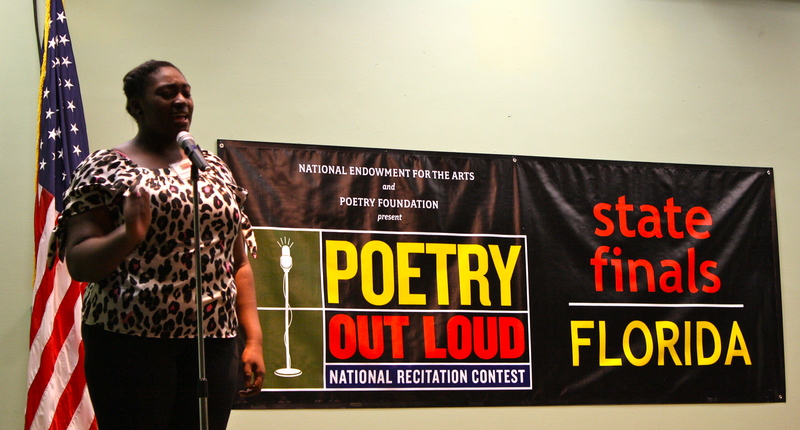 Here in Tallahassee, the Florida Division of Cultural Affairs hosted our statewide Poetry Out Loud competition March 8th and 9th. The program is a contest that encourages the nation’s youth to learn about great poetry through memorization and recitation. Poetry Out Loud is a partnership between the National Endowment for the Arts and the Poetry Foundation. For a full breakdown of Florida’s event, replete with pictures, see our previous blog post. The 2013 Poetry Out Loud Florida State Finals champion Kourtney Brooker, reciting her poem during the final round. Elsewhere in Florida, the Gasparilla International Film Festival was held in Tampa from March 19th to the 24th. Since its inception in 2006, the festival has continued to draw international crowds with its exciting crops of filmmakers, actors, and writers, who all come together for a week of brilliant cinema. This year’s festival was no different. One of Florida’s own independent filmmakers, Lawrence Feeney, president of Pasco Films, took home the Audience Award in the Narrative Feature category for his film, Pharmboy. The film, which was shot in Pasco County, is a fictional account of a teenager who was born addicted to prescription pills. The festival also features the work of another Floridian, Vaughn Wilkinson, who played the lead in the independent feature film Against the Grain. Wilkinson, who graduated from Tampa’s King High School in 2002, has had success in national commercials and a part on 90210. March was also Florida Archaeology Month, and for two New College students, it paid off. Matt Andersen and Jodi Johnson won Cornelia D. Futor Archaeology Student Grants, sponsored by the Time Sifters Archaeology Society of Sarasota. The grant competition is open to undergraduate and pre-doctoral graduate students enrolled at a college in the Sarasota, St. Petersburg and Tampa area and is based on excellence in archaeology research papers. At the Florida Museum of Natural History this month are the fossilized remains of a giant crocodile. The fossils are from the same coal mine in Colombia where the 48-foot-long “Titanoboa: Monster Snake” was discovered. “This is extremely exciting because we’ll be unpacking the first lower jaw discovered of this giant, 30- to 40-foot-long crocodile relative we believe may have actually battled Titanoboa,” says Florida Museum vertebrate paleontology curator Jonathan Bloch. University of Florida doctoral candidate Aldo Rincon discovered a tooth and lower jaw segments of an extinct hippo-like species while excavating in the Panama Canal. His research has recently been published in the Journal of Vertebrate Paleontology. The fossils are being held at the Florida Museum of Natural History for analysis. The Jacksonville Zoo, seemingly in preparation for the upcoming 20th anniversary re-release of Steven Spielberg’s Jurassic Park, has opened its very own version of the fictional park. DinoTrek features 21 life-size animatronic dinosaurs, as well as a unique comprehensive experience. Visitors pass through a Jurassic Park-like gate, follow a foggy path to a moat, cross over on a floating dock and enter a heavily wooded area where the dinosaurs move, roar and snarl. DinoTrek also offers a dig site when kids can excavate fossils. The exhibit will continue through June 30th. With the Voyager 1 spacecraft rapidly making its way out of the solar system, space is once again making the news in Florida. Space Florida, the state’s public/private space development corporation, wants to convince NASA to release 150 acres of its land now contained within the Merritt Island National Wildlife Refuge or Canaveral National Seashore to operate a commercial spaceport outside the security perimeter of NASA launch facilities. They will make their first appearance before the Volusia County Council on April 4th. Saturn V rocket engines from the famous Apollo 11 mission to the moon were discovered by Jeff Bezos off of the coast of Florida. Bezos, founder of Amazon.com and its CEO, said in 2012 that he planned to recover those specific engines. The rocket engines remain property of NASA and the U.S. government, and Bezos has indicated that he would like to pull the engines to the surface and then have NASA put them on display at a museum in Seattle. The noteworthy collaboration between the National Aeronautics and Space Administration (NASA), the John F. Kennedy Space Center Visitor Complex (KSCVC) and the Museum of Arts & Sciences (MOAS) continues with over forty pieces from the heart of the NASA art collection. Florida Celebrates Space is open at MOAS through April 28, 2013. The exhibition is offered in celebration of the 500th anniversary of Ponce de León’s discovery of Florida and illustrates the peninsula not only as a destination for the first explorers, but as a gateway for those launching to explore new worlds beyond Earth. Included are pieces by Annie Leibovitz, Andy Warhol, James Wyeth and Robert Rauschenberg. To accompany the exhibition, MOAS is offering special Florida Celebrates Space events and activities through April, 2013. 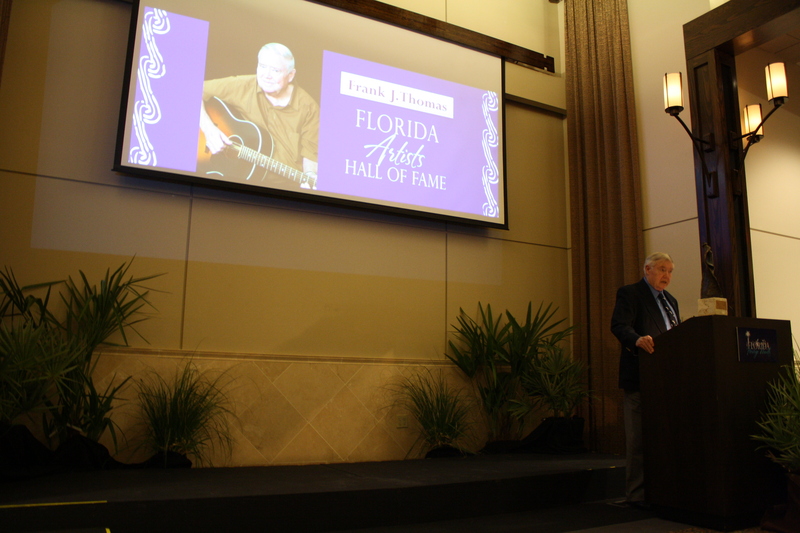 Frank J. Thomas being inducted into the Florida Artists Hall of Fame during the Florida Heritage Month Awards. Photo by Gary Pettit. Florida Heritage Month began on March 15 and will continue until April 15. The Florida Heritage Month Awards Ceremony was held on March 20 at Mission San Luis in Tallahassee. The event included a reception, cultural performances, the Florida Folk Heritage Awards, Secretary of State Historic Preservation Awards, Florida Book Awards and the induction of artists into the 2013 Florida Artists Hall of Fame. If you’re looking for things to do in April, it’s Jazz Appreciation Month so check out some live performances between now and Jazz Day on April 30. As always, keep your eye on the Viva Florida 500 calendar all year long and check out the local cultural calendars in your area!